Assassinate Ma'randru-jo to complete a Dark Brotherhood contract. Return to Nazir and receive your reward. When Ma'randru-jo is not wandering the roads of Tamriel, he can be found in one of the caravan camps led by Ri'saad. The caravan travels the route between Markarth and Whiterun and spends two full days camped outside each city before alternating. Since he does not stay stationary, he can be hard to find. However, the map indicates his position. To find him simply travel to his known location, check the map, then travel to his new location. Continue this until he is found. Once you have located him, you may talk to him. Like most other assassination targets, you are given three dialogue choices. 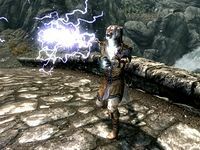 If you choose to insult him, he will attack you first, so you can then kill him without the fear of incurring a bounty and being arrested by the town guard, or attacked by the rest of the Khajiit merchants. Alternatively, you can sneak kill him without being detected by the rest of the merchants. Return to the sanctuary and speak with Nazir to complete the quest and receive a reward of leveled Gold. If you're a Khajiit, Nazir will remark "How went your encounter with Ma'randru-jo? Back in Hammerfell, I always loved watching two cats rip each other to shreds...". Ri'saad, the caravan leader, is essential. If the other Khajiit attack, you will be unable to kill him. 10 I must find and kill the Khajiit Ma'randru-jo, a merchant who travels with one of the caravans. I may use any means at my disposal. When I am done, I am to report back to Nazir at the Sanctuary and collect my reward. 200 Finishes quest Ma'randru-jo is dead, and I have collected my reward from Nazir at the Sanctuary. On the PC, it is possible to use the console to advance through the quest by entering setstage DBSideContract07 stage, where stage is the number of the stage you wish to complete. It is not possible to un-complete (i.e. go back) quest stages, but it is possible to clear all stages of the quest using resetquest DBSideContract07. This page was last modified on 26 April 2014, at 04:32.